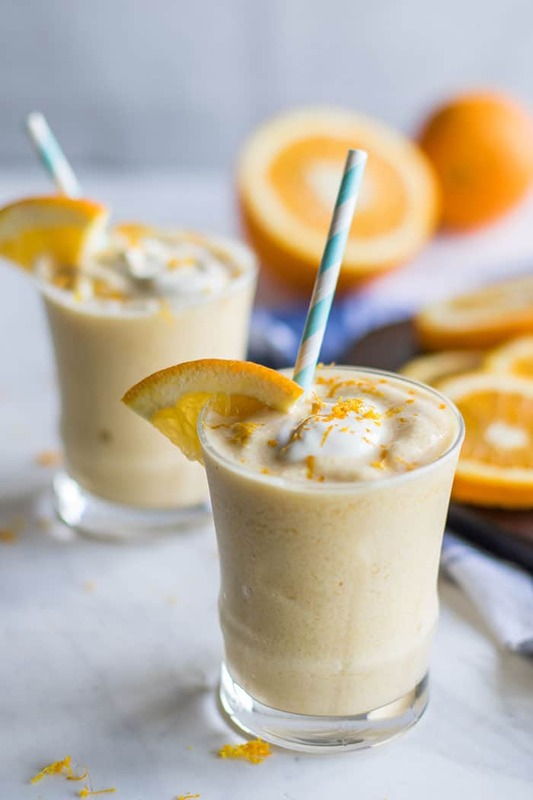 This Healthy Orange Julius Smoothie is a flashback to childhood! They were my favorite treat when visiting malls. 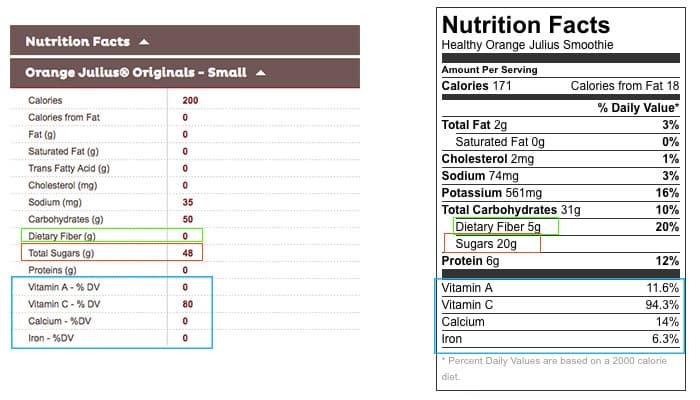 This fresh orange smoothie is a much healthier version, as shown in the nutritional stats comparison below! *This post was originally published in April of 2015, but has been updated with new photos, and a recipe with the amount doubled. It continues to be a popular recipe on Vitamin Sunshine, and a favorite treat in our house! As a kid, we didn’t go to malls or out to eat often. When we did, my mom was pretty lax about the choices we made. She turned a blind eye when I would fill my plate with an egg-bacon-cheese “salad” and chocolate mousse at buffet restaurants, and order deep fried chimichangas at Mexican restaurants. A stop at Orange Julius when we were in malls was mandatory! Creamy, delicious, and — made of oranges? A pretty good “treat”, right? I’m not quite sure what sodium carboxymethylcellulose or Maltodextrin is, but I am pretty sure I will NOT be feeding it to my son. I do see dextrose, sugar, and corn syrup solids — 3 different forms of sugar. (Lots of these ingredients are on my Food Additive Nix List (free printable available)- a great resource for navigating nutrition labels!). I was surprised to see actual concentrated orange juice on the list, especially considering the nutritional stats. The mall drink is packed with more sugar than a can of soda, and besides having vitamin C from the orange juice it contains, it’s devoid of nutrients. It’s a sugar bomb with no protein and no fiber. 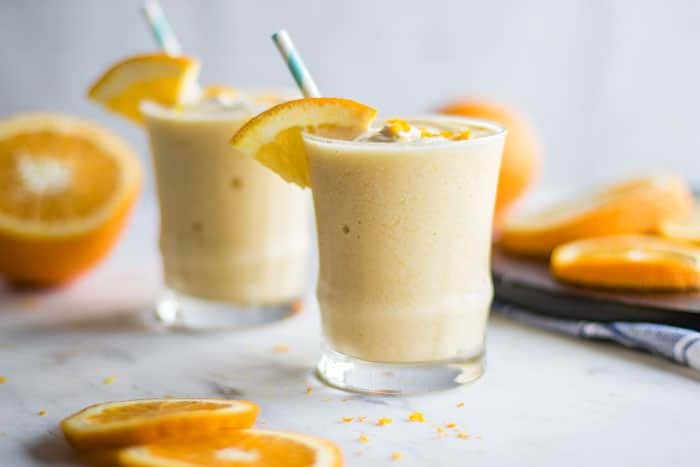 My Healthy Orange Julius Smoothie is made with real fruit, and contains no added sugars — the 20 grams it contains come straight from the oranges and banana. Because it’s made with whole ingredients, it also has a nice dose of fiber, Vitamin A, calcium and iron. Are Oranges Good in Smoothies? I didn’t start using whole oranges in smoothies until I got a Vitamix. That thing will blend just about anything into a smooth texture. Since I use the oranges fresh and not frozen in this smoothie, it will also work in a regular blender. 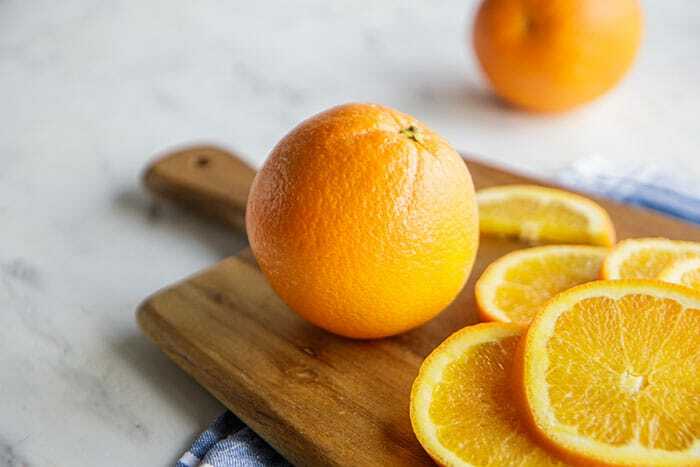 Fresh oranges add a ton of sweetness and a tart flavor that I love to smoothies – so although this fruit is often overlooked at smoothie bars, it shouldn’t be! How do you Make an Orange Julius at Home? An Orange Julius is just a frothy vanilla-orange smoothie. When I was a kid, my mom would make them for us at home by using concentrated orange juice, and blending it with ice and vanilla. That’s where I got the idea for this easy Orange Julius recipe. The one from the mall is light and creamy, so I like to add either almond milk or coconut milk. I also find that using whey protein isolate, in addition to giving it a protein kick to make it more satiating, gives it that frothy and light texture. Make it Vegan: Sub your favorite vegan protein, or omit the protein power. Make it Your Own: Turn this healthy Orange Julius Smoothie into a healthy Strawberry Orange Julius by adding a couple of strawberries. Add spinach for an extra nutrient boost. I also like making this with grapefruits for an extra tart but still creamy and delicious treat. Replace the classic mall drink with a healthier orange smoothie made with whole fruit. This version is naturally sweetened with fruit and makes a healthy and refreshing snack! For a thick smoothie, be sure your banana is completely frozen prior to making a smoothie. I also only use 1/4 cup of liquid to keep things on the thicker side. 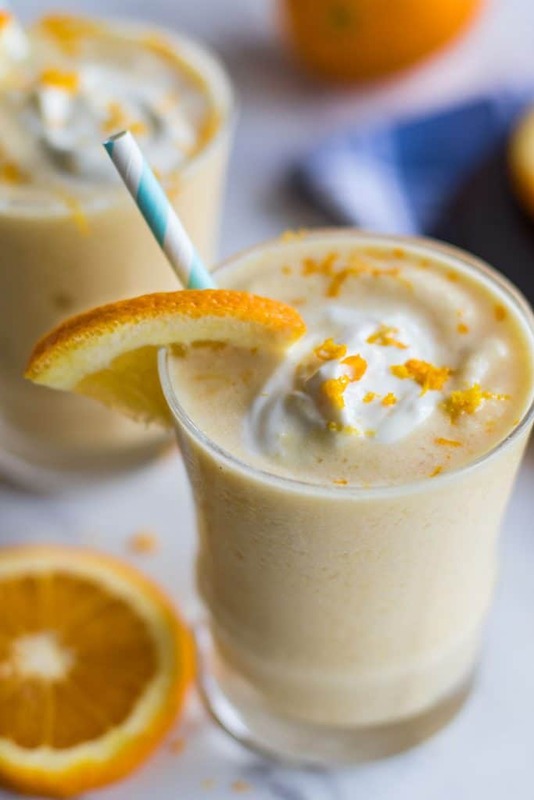 Add peeled oranges, frozen banana, ice cubes, your choice of milk (can sub orange juice for a sweeter smoothie), optional protein powder, and vanilla to a blender. This works best in a high speed blender, but can be made in a good quality standard blender. Blend until the oranges are completely smoothie and the smoothie is thick and creamy. Top with a dollop of yogurt or coconut cream, if desired. *Use almond milk for the lowest calorie/sugar smoothie. Use orange juice if you'd prefer a sweeter smoothie. I often use coconut milk to add a bit of extra creaminess and richness to the smoothie. *Whey protein is optional, but I recommend it for the best texture. The whey protein isolate I've linked to in the recipe is unsweetened, but has a natural vanilla flavor added that also adds an extra boost of vanilla flavor. So happy for you, Michelle! And so glad things have settled down a little. This creation is exactly what I needed right now because I'm so ready for a change up. I've skipped my protein shake for almost a week now because I couldn't bear to drink the same old thing, lol. So much excitement and fun in your future and how wonderful that you'll be off just before your delivery date! Thanks Robyn. We are getting really excited-- I can't believe how close it is now. WOW! Congrats Michelle- This is so exciting!!! Yes, very exciting! Thank you. Congratulations Michelle! I am so excited for you! I remember how difficult it was during pregnancy and there is no way that I could have a food blog...I am glad things are starting to stay down and great for you and the vitmaix. 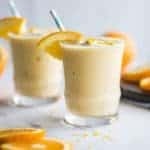 Orange Julius are so retro and perfectly refreshing for this humid and warm weather. Take care of yourself little mama! Virtual hug coming your way. Sharing everywhere, of course!